Experience the magic of precious stones on Magic Crystals Slot at Wicked Jackpots! Created by Pragmatic Play, it consists of 5 reels and 243 Ways to Win. This brightly coloured game is set against a blue backdrop filled with crystals that seem to be magical! The reels are set within a thin golden frame, full of symbols like the polished Green, Yellow, Violet and Red crystals, as well as their uncut versions. This beautifully designed slot is playable on any device at Wicked Jackpots! On Magic Crystals Slot, pick your preferred coin size on the Coin Value display. On the Bet field, you can choose your desired bet level. With the + and – buttons on both fields, set your preferences and click on the Spin button. Combine 3 or more of the same symbols on the reels to earn a win. With the Auto Play tab, you can set 10, 20, 30, 50, 70 or 100 spins to be played automatically. Amount of Paylines Selection: The 243 Ways to Win are always in play during the game. Coin Values: The coin denominations are 0.01, 0.03, 0.05, 0.10, 0.20 and 0.50. 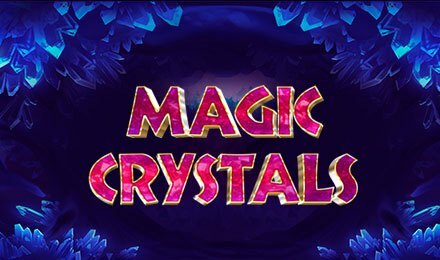 Magic Crystals Slot uses the 243-Ways to Win engine and so, the winning combinations are formed when similar symbols appear on adjacent reels from left to right. Make the most of the win multipliers! When a Wild symbol is part of a winning combination, 2x and 3x multipliers are combined, going up to 6x. This creates additional winning opportunities. The Golden Scatter on Magic Crystals Slot helps to generate the Free Spins Feature. Land 3, 4 and 5 Golden Scatters to receive 15, 20 and 25 free spins, respectively. During the feature, the payouts are also tripled. But when a Wild symbol forms part of a winning combo, the win is doubled. There is no limit to the number of free spins you can retrigger. Earn extra free spins when 3 or more Scatters show up during the round. A symbol to look out for is the Dark Obsidian! It is Wild for all symbols apart from Scatter. Enjoy the magic anytime by launching Magic Crystals Slot on Wicked Jackpots. Best of luck!